The management committee decided to have two fund raising events this year to help strengthen the financial position now that we employ 3 full time and one part time staff. We use to employ only two staff for many years until 2010. The staff increase was inevitable as we require focused supervision of the trainees in the three projects, namely straw packing, card and handicraft, and bakery and cafe. One of the staff is fully engaged in handling administrative work and accounts as well as liaison with various government agencies. In fact we plan to employ additional staff to meet new challenges in the coming years. 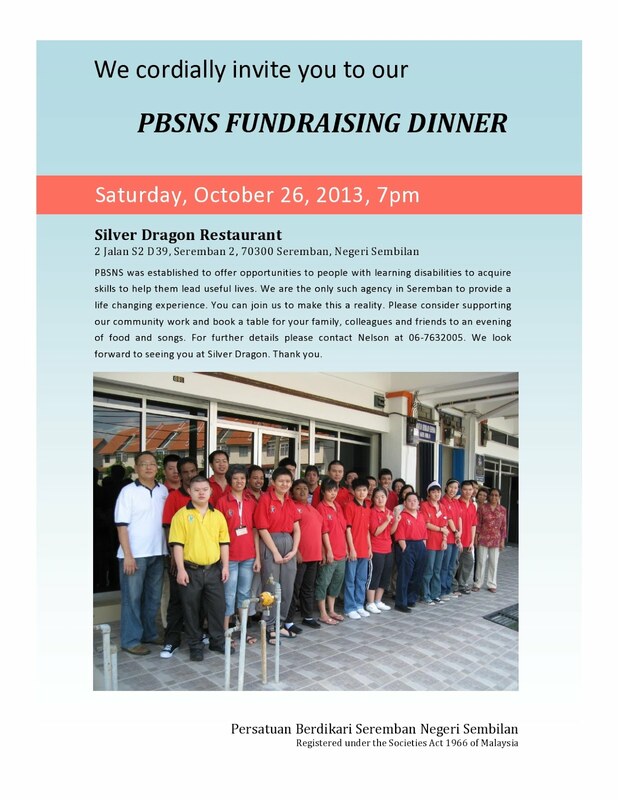 The two fund raising events are a fashion show (to be held sometime mid year) and a charity dinner on October 26, 2013 at the Silver Dragon Restaurant in Seremban 2. Those who supported us during our first charity dinner in 2010 will remember the venue which is in great demand because of its excellent facilities. A task force was formed and held its first meeting today. Many areas were covered and we are ready to move ahead with promoting this event although it may seem to be very far away. A few more meetings will be held to finalize the matters of guest of honor, performing artiste, ticket printing and sales as well as production of a new brochure to replace our depleting first edition stock. 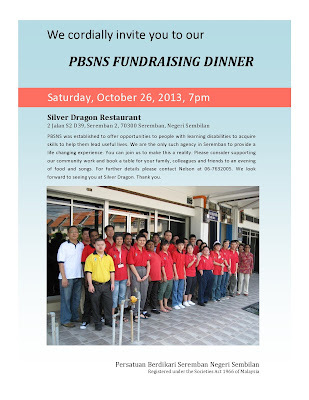 We are excited about this dinner event and we certainly hope you will give us your support. Ticket sale will begin towards mid year but this has been agreed: RM1000 per table or RM100 per ticket Donation of RM2000 will entitle the donor to one free table. Thank you.